The scribes and Pharisees were testing and trying to trap Jesus. If Jesus said to not stone the woman, it would be a violation of Jewish law. They would then accuse Jesus of being a false teacher. If Jesus said to stone the woman, it would be a violation of the Roman law. The Jews had no authority to put anyone to death. Jesus’s response reveals the hypocrisy of the woman’s accusers and restores her self-worth. 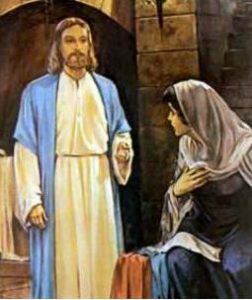 Perhaps each time we listen to today’s gospel proclaimed about the woman caught in adultery, we wonder what did Jesus write on the ground with his finger? Again he bent down and wrote on the ground. And in response, they went away one by one, beginning with the elders. The Scriptures do not tell us what Jesus wrote…but we see the impact of what he wrote, such that only the woman was left standing before Jesus. At the end, the scribes and Pharisees, who came to stone the woman did not condemn the woman and neither did Jesus. Then Jesus said, “Neither do I condemn you. Go, and from now on do not sin any more.” Jesus could very well be saying these same words to us, especially each time we leave the Sacrament of Reconciliation. The real test turned out to be for the scribes and Pharisees. They had to make a decision, to either stay and repent and therefore receive God’s mercy and forgiveness, like the woman or leave and not repent. What decision are we making this Lent when we encounter Jesus – are we willing to change our sinful inclinations and habits? This is what St. Paul tells us in today’s passage from the Letter to the Philippians, …to know him and the power of his Resurrection. We too seek to know the power of Christ’s mercy and forgiveness that transforms our lives. The Lord as done great things for us; we are filled with joy.